2012 I found my self busy with building walls in residential neighbors. With limited space on a few of the job sites I wondered how handy a small walk behind skid steer would be? I had seen two other dry laid masons, Russ Beardsley and Dean McLellan who used this type of machine all the time. I had talked to both and they loved them! Having a skid steer I never even gave it any thought. I had used a mini walk behind once for installing fence posts with a auger. I honestly thought the machine was a JOKE! 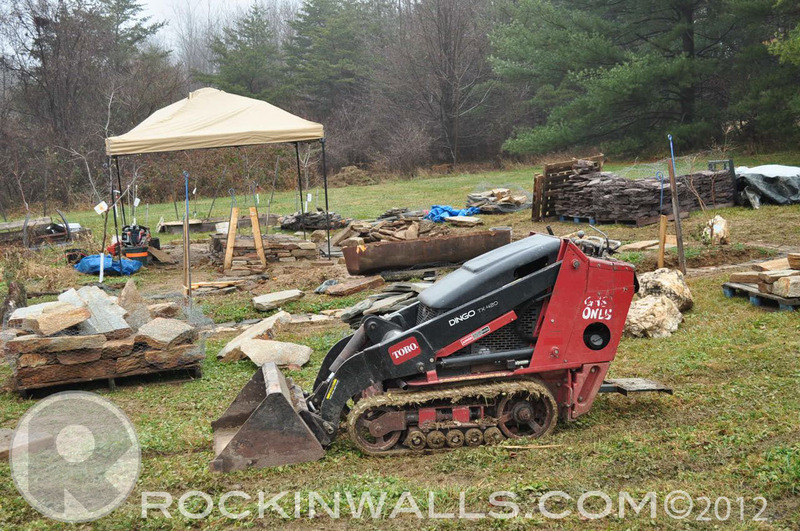 Until the logistics of minimal space for a large machine on the job site came into play. I began doing my homework about a year earlier. 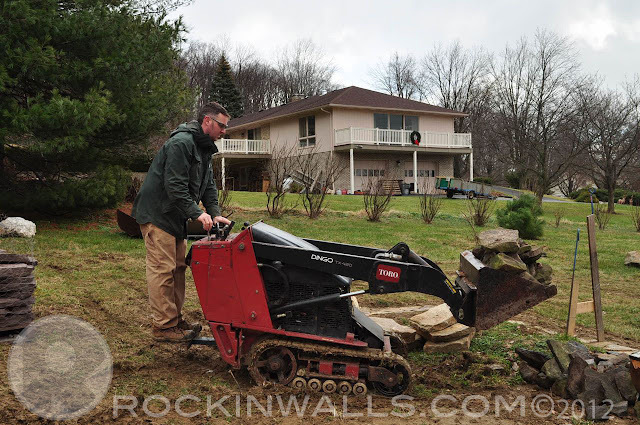 I had read great things about the Ditch Witch, Toro and Bobcat. From what I understand Toro was the creator of the concept. Of course you can find pro's and con's on just about any thing made by man. I decide to look at the Toro for couple reasons - easy to get parts locally. Many of the rental shops in my area used them which says something right there- the love them. Affordability! You can find a nice machine with low hours and in a price any one could justify. I didn't want to spend over $7000. So I began my search! I had my eyes on a Toro with tires - the price seemed right ($6500, 400 hours with 2 buckets and set of forks add $400 +/- per attachment). After returning from a summer vacation I followed up with the one I had my eye on - only to find out it had been sold. In no time I found another one with tracks for $5500 with 800 hours. I was surprised since most track machines normally run in the $8000-$15000 range used. Heck that's nothing if you think thats a lot! Price out a new one!! Ya this is why I own a skid loader. Who in their right mind would spend that kind of money when a skid steer really gets the job done? Those who work in tight areas. You can't fit skid loader throw a gateway. I called the fellow selling a Dingo TX 420 on a holiday Sunday. He said sure I'm not doing anything I can meet you and show you the machine - Heck ya now what I didn't tell you was I had cash in hand when I was coming back from my vacation I stopped at my bank - so I could buy the tire machine. Funny how things work out...in life. Road trip with the dump truck and trailer. After a little loud exhaust leak. I figured I this would be a smart investment. So I bought it. For the next several months it sat at my buddies shop waiting in line for service. Only to need a front wheel replacement $300 and a exhaust weld. $500 later I was cleared for take off. After purchasing my new/used machine and it sat in the shop, I had the opportunity in September 2012 to see Dean McLellan in action in Canada with his Bobcat MT55 at StoneWURX. We worked that machine around the jobsite like he was the incredible hulk. 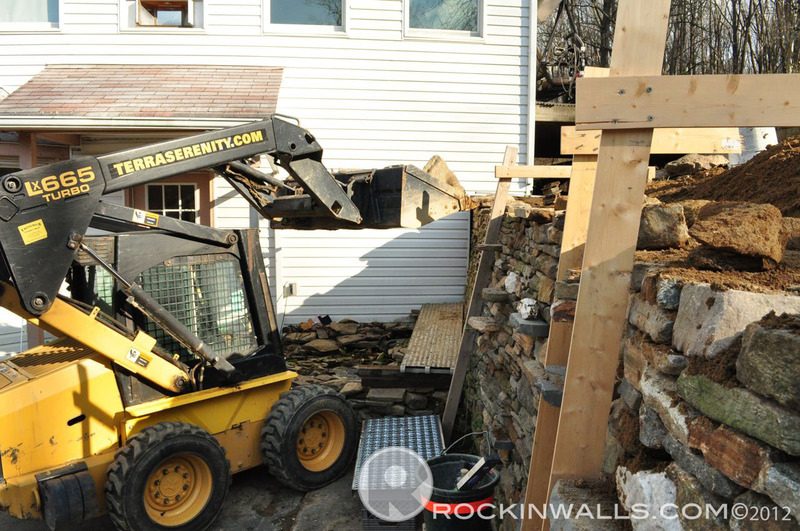 Moving piles of stone from one side of the building to the other. - Lifting on average is 500 pounds with some that can lift as much as 1000 but you'll be paying the $$$ for one of those. - Tire or track choice - Wide or Narrow? YES choices. - An employee without the payroll or workman's comp. I say this because truly what you would pay to have a employee in a year doing the work this machine can do - YOU CAN BUY A NEW ONE! Yes it pays for itself in one year! - Gate size widths on average 34 inch wide some with tracks that can move in and out. Other machines have wide tracks. - You can step away from the machine and make adjustments - for example if you need to lift a stone to make adjustments with a strap or forks you can. If you had a full size skid loader you'd have to unbuckle the seat belt get out of a cab - O wait you don't want to crawl under the boom-no no no safety first. With a mini you just walk around and can easily make adjustments from the side of the machine without all the extra hassles. The controls are easy to reach without a great deal of complications. 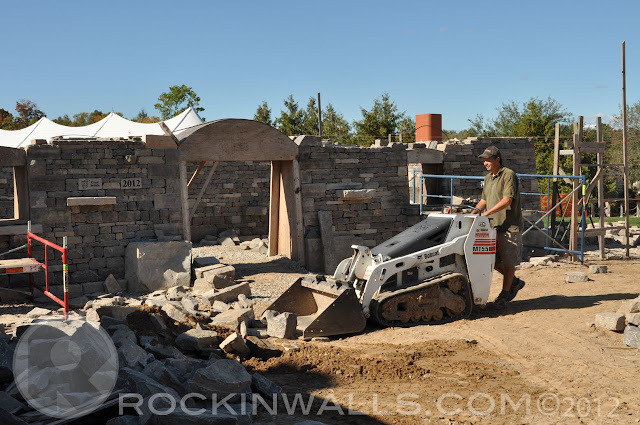 - Does OK with digging dirt and stone - but not like a skid loader will - but hey what would you expect its just a smaller machine. 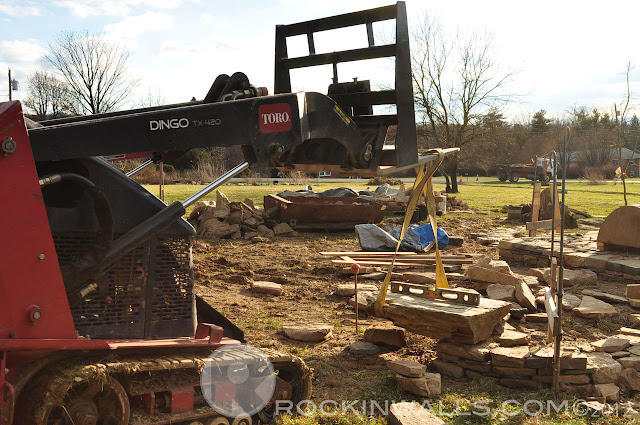 - The cost to buy a Mini Skid Steer is about the same as a full size machine?! - Not great for excavating / dirt grading with the bucket like a skid loader can but will get the job done in little more time. - Can't lift as much as skid loader can - requiring a little more time moving material. Cliff notes - a motorized wheelbarrow! I wouldn't changed anything about my buying choices. A full size skid loader first and a mini if I needed it! Now I need it. This little machine rocks. Every day I use it I learn that much more as to what I can do. 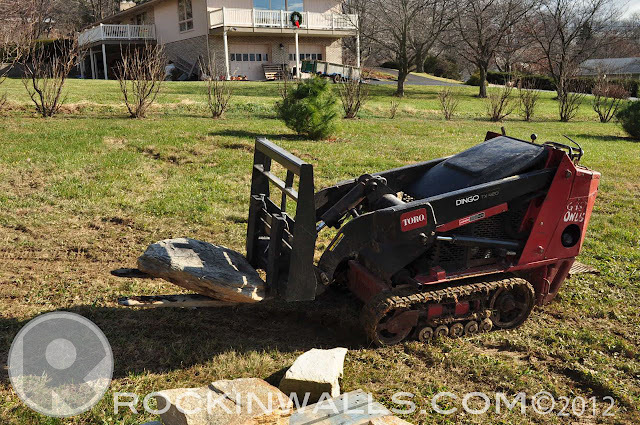 The Toro TX-420 is a gas machine with a Kohler® Command Pro® Series 20 hp engine. Looking at the market place you have a lot of choices. If you need a machine like this be sure you have a local dealer. That the machine fits your day to day needs, then your budget. I've seen the TX-420 selling from $4000- $10000. If you're looking to spend the higher amount try some machines before you buy. Such as having a demo brought to your job site or just rent one or two. Some might ask why not rent? For me renting never makes sense for a couple reasons. 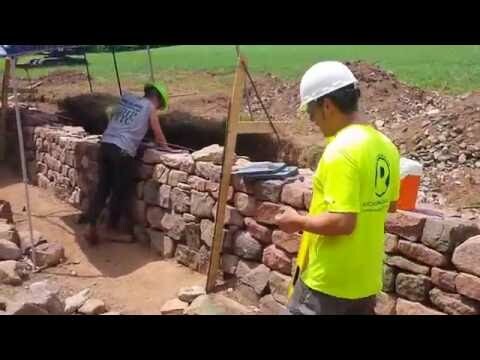 I work part time with stone. To pay for a rental would cost me more then owning. The time picking up and returning the machine is billable labor you can't bill and wasted time. My machine rented locally would cost me $230 a day. $6200 -:- $230 = 27 days. YOU DO THE MATH. Mark, You do love your power tools. I still can't justify the cost. And I still love the hard work. Your going to be a soft old man, or I'm going to be a broken one. My chiropractor thinks all my hard work has been great for me. So I'll be keeping it manual for a while. At least until I get the job that justifies the investment. T.J.
TJ I think your 20 years younger then me.... ha ha. Plus you live and work in Vermont where the sky's big and blue. I do love my equipment and my body. Just like the right hammer for the job - I have the right machine. I use as much manual labor I can but I only have so much time so a machine speeds up the process. Don't worry - it won't be long before you have one. Then you'll wonder how you lived with out it for so long. Just a matter of time.....Your not supposed to give away my secretes about being a soft old man. I thought we were keeping that between us?!!! This piece of equipment enables us to maintain the growing need and develop effectiveness at which we can easily assist our clients. I love the Dingo. Heck my friends call me Dingo. I was a sceptic for about an hour until i was comfortable with the controls. My local rental joint rents to me for $125 per day. No fuel or cleaning charges. I have used a variety of attachments. I have decided to sell my GT500 Mustang and get myself a Dingo! It is a lot more fun! StoneWurx - Ground Effects Landscapes THANK YOU!